What software do you I need to create my website? In all reality, you only need a text editor. But we are going to step further and showing you the 5 website software you only need to create your site. This is the single best piece of software for web development. Yes, Notepad++ is just a text editor, but it takes almost no computer resources to run. Which means it loads almost instantly. It is fully compatible with WinSCP, I’ll get to in a minute. It has nice colors to differentiate tags, functions, and variables. In any coding language you are developing in. You can enhance it with various plug-ins like Macros, FingerText and file Compare. This helps increase your productivity and usability. "Plus" it doesn’t cost anything, completely free. WinSCP is one of the best open sources FTP programs on the market. You can access your server via FTP or SFTP. This gives you the ability to upload, download, and manage your file system on your server. 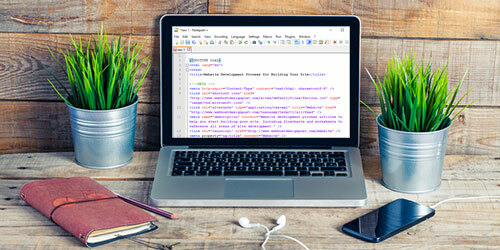 With Notepad++ as your text editor, you can easily edit small changes live on your website. There are other graphic designing programs like GIMP, but it just isn’t Adobe Photoshop. Other designers like to use Adobe Illustrator for their graphics, but it lacks the ability to edit camera photos. Photoshop is an all in one package to edit photos, create graphics, and text. This sets you up to edit your product images, create icons or design elements, and create promotional banners. There are a lot of alternative applications for Microsoft Office. There is OpenOffice, Google Docs or using Microsoft’s Sky Drive Office Apps. What I'm trying to explain is that you need a good word processing application. Having a word processing application will keep your spelling and grammar mistakes in order. A spreadsheet will help you keep things organized and help you track different information. For any client-side web developer, you will have problems with your HTML and/or CSS. Sometimes those problems can be a hassle tracking down. The days when you would make a change, save, refresh, trying something else, save, refresh, etc. With Google Chrome Developer Tools you can fully change anything in your HTML or CSS and see it live on the page. This makes productivity fly when you can add CSS and instantly see what effects it has on the page. Your changes will not save automatically from the developer tools. You will have to copy and paste or rewrite the code to your files and save. Even with the small amount of work, it will save you a ton of time. These are the 5 website software applications you only need for your website. You might run into situations that will require additional applications. Such as audio and video editing, or marketing. That is why there is a bonus section, where these are not necessary for your website, but you will want to have them in your back pocket. Adobe Premiere is one of the easiest audio and video applications in the industry. It will import all main audio and video formats and export to all main formats including YouTube. It has built in smooth playback, audio and video transitions, and text overlays. This is an online software but is very useful in managing your search engine optimization marketing plan. Moz can help you determine which keywords to target for content marketing. See your competition, show site issues and errors. And help you find authoritative backlinks. You can do this without any software, Moz just make it much easier. Is Web Page Design Software Necessary?